Oberlin bed and breakfast travel guide for romantic, historic and adventure b&b's. 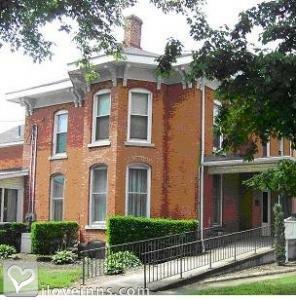 Browse through the iLoveInns.com database of Oberlin, Ohio bed and breakfasts and country inns to find detailed listings that include room rates, special deals and area activities. You can click on the 'check rates and availability' button to contact the innkeeper. Oberlin, Ohio is best known for being home to the college of the same name. The local wineries are said to be among the best in the state. These are Ohio Wines, John Christ Winery, Great Lakes Brewery, Klingshim Winery, E&K Winery, Firelands Winery, Quarry Hill Winery, Vermillion Valley Winery, and Paper Moon Winery. Oberlin has several golf courses within 15 to 20 minutes drive. These include Deer Track Golf Club, Indian Hollow Lake, and Pleasant Run Golf Club. Shopping in Oberlin includes Campbell House Antiques, Main Street Antique Mall, Prince & The Peddler, and Touched by Grace. Most of the attractions in the city are easy to visit from Oberlin bed and breakfast inns. By 1830 Hallauer House Bed & Breakfast.